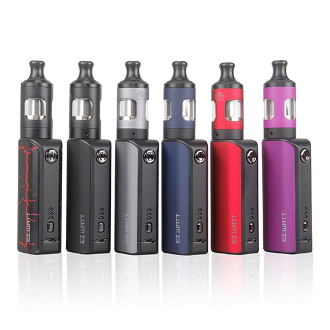 The EZ.WATT is an amazing kit that has both beauty and premium quality. It's an easy to operate device and really great to vape as the Prism T20S tank delivers incredible flavor with a mouth to lung hit. The EZ stands for easy and makes it a great kit for all types of vapers. There are three optimized wattage levels that be chosen by a cycle through feature using the power button and the select button. Three color led lights will indicate your chosen levels of wattage: 13-14 watts, 15-18 watts, and 30-35 watts. Of course like most up to date devices the EZ.WATT has a passthru function that allows the user to charge and vape at the same time with its 1500mAH battery life.